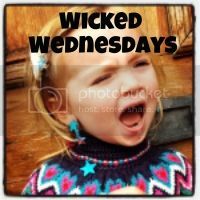 Wicked wednesdays – 10.03.16 – I Want To Climb The Stairs Toddler Tantrum! This is a sight which is happening more and more… Along with screams, tears and a very red face. H just hangs off the stair gate. She sometimes does this shrieking with laughter and smiling, othertimes she gets really worked up wanting to climb the stairs. She even goes one handed. This picture is from my 5 Everyday Tantrums at 15 months post. Linking this new toddler tantrum to Brummy Mummy of Two for WickedWednesdays. 5 Everyday Toddler Tantrums – at 15 months old! Kim Carberry recently posted…Proud of my little baker….